The Council of the American Astronomical Society (AAS) has endorsed the vision statement that emerged from the inaugural Inclusive Astronomy conference in Nashville, Tennessee. 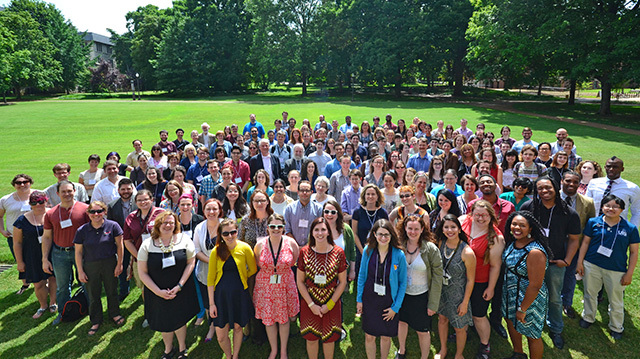 For three days in June 2015, 160 astronomers, sociologists, policy makers, and community leaders met at Vanderbilt University to discuss issues affecting people of color; lesbian, gay, bisexual, transgender, genderqueer/genderfluid, agender, intersex, queer, questioning, or asexual (LGBTIQA*) people; people with disabilities; women; people disenfranchised by their socio-economic status; and anyone in the astronomical community who holds more than one of these underrepresented identities. A key focus of the meeting was examination of issues of intersectionality: the well-established idea that racism, sexism, heterosexism, transphobia, and ableism are often linked (e.g., women of color suffer at the intersection of racism and sexism). University in Nashville, Tennessee, June 2015. Courtesy IA 2015 organizers. 4) Establishing a community of inclusive practice, e.g., using active rather than passive measures to ensure that astronomers’ groups, events, and institutions are inclusive. The Inclusive Astronomy recommendations are meant to serve as a roadmap for equity and inclusion in astronomy. Just as roadmaps need to be changed as communities grow and evolve, the recommendations will be expanded and revised with significant input from the astronomical community, especially from members of marginalized groups, at future Inclusive Astronomy conferences and semiannual AAS meetings. In other words, they’re a work in progress. The AAS Council endorsed the vision statement accompanying the draft recommendations; it describes the underrepresentation problem and explains why equity, diversity, and inclusion are important for the astronomical sciences. As these examples suggest, the ongoing underrepresentation of individuals from various groups is not just a problem of experiences and barriers within our profession. We live in societies that host systemic biases and power differences based on race, gender identity, sexual orientation, ability status, and class. As we work for equity and inclusion in our field, we cannot ignore the broader society and the negative impacts it produces on current and potential colleagues from historically marginalized groups. We can repair the “leaky pipeline” within our profession only by also understanding the broader society within which our profession operates, the lived experiences of our students and colleagues when they are “out in the world,” and the biases that we all bring with us from the broader society into the places where astronomers work and learn. Indeed, most astronomers who are some combination of female, LGBTIQA*, disabled, or a person of color, can tell stories of overt discrimination, microaggressions, and hostile climate; the literature tells that same story. The situation is clear: Astronomy must become more inclusive. Creating a more inclusive field is not just the right thing to do: The current lack of diversity and inclusivity within astronomy harms our profession. Research shows that diversity leads to greater innovation, more creative thinking, and higher-quality science. The breadth of knowledge and experience brought by people of color, women, LGBTIQA* people, people with disabilities, other traditionally marginalized individuals — and most particularly, anyone who shares more than one of these identities — is necessary to achieve our full potential for discovery and exploration, and to recruit and retain the many creative minds we need to solve fundamental questions about the universe. Making astronomy more inclusive and thus diverse is also necessary for maintaining the appreciation of our field by the increasingly diverse public who fund our exploration. We believe that people of all races, genders, sexual orientations, and physical abilities are capable of doing excellent science and shaping the future of our discipline. We know that identity is intersectional, and we see connections among barriers facing communities of color, women, people with disabilities, and LGBTIQA* people in science. We believe in equal opportunity. We share a vision of a more inclusive, more productive profession. We know that true inclusion and diversity require hard work from individual astronomers, organizations, and our profession as a whole to re-examine our professional culture, modify our existing practices, and remove barriers to inclusion. We assert that progress can and should be measured, and should be pursued with the same zeal as other strategic scientific goals. We have faith that we all — as colleagues and as a profession — can learn and improve.